This Sunday, we are inviting our mothers to join us at our home for a barbecue; and when I say barbecue, I mean pulled pork that’s been slowly smoked for hours, barbecued chicken, baked beans, corn-on-the cob, and coleslaw! At first, I had planned on making more traditional (and more ladylike) brunch fare–perhaps a quiche, a cake, finger sandwiches…but then it hit me that my mother has been wanting me to make pulled pork for quite some time and I simply haven’t had the time to make it–it takes about 4 to 6 hours to smoke. Now that our propane grill has been converted to natural gas, it’s easier and more convenient to smoke a large roast without worrying that I’ll run out of propane before the meat is done. So, now that there aren’t any excuses, I’ll be smoking that pork shoulder roast all day tomorrow! At this moment, the pork shoulder roast is marinating in a spice rub. I’ll be posting the recipes and the how-tos throughout the weekend! To get things off to a good start, this mango-banana daiquiri will definitely be on the menu! I think these daiquiris will get the moms in the mood to relax and enjoy their day–because that’s really what moms really need right? This recipe is from Ina Garten’s “Barefoot Contessa Back to Basics” and I really love the fact that it can be made in a large batch in a blender. It’s sweet and full of tropical flavor and I think the drink is perfect to serve for Mother’s Day brunch, whether you’re having something ladylike or getting down to some serious finger-licking grub! It’s important that you use mangoes that are nice and ripe–you can tell they are ripe when they give a little when you squeeze them. If your mangoes aren’t quite sweet and ripe enough, you can always add some canned mango nectar to sweeten it a bit. 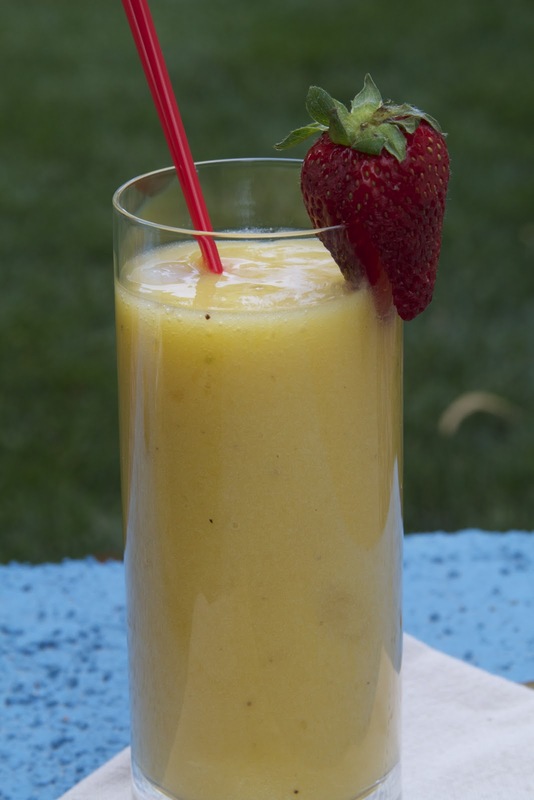 Add the mango, banana, lime juice, simple syrup and rum to a blender and puree until smooth. Add 2 cups of ice and blend until it is smooth and thick. Garnish with the mango slices. Could this be any easier? I don’t think so! Makes 4 drinks. *simple syrup: heat 1 cup sugar and 1 cup water in a sauce pan until the sugar completely dissolves. Chill before using. Previous PostGarden Update: How Does Your Garden Grow?